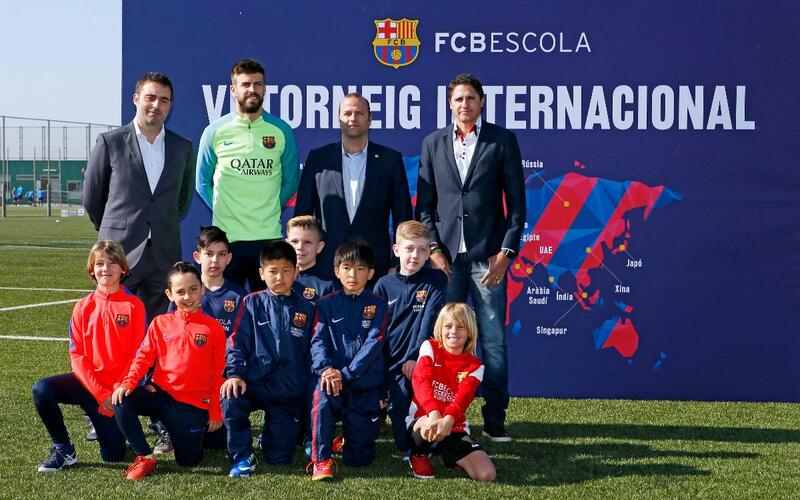 The sixth edition of the FCBEscola International Tournament was presented on Friday morning in the Ciutat Esportiva Joan Gamper pressroom in Sant Joan Despí. The competition from April 10 to 13 will bring together more than 1,500 children from 20 countries and 33 different FCBEscolas and FCBCamps, a 25% rise in participation on 2016. The event was presented by director Xavier Vilajoana; FCBEscola global ambassador José Edmílson; and FCBEscola project director Franc Carbó. The ambassador of the tournament is first team star Gerard Piqué, who is the ‘sporting father’ of FCBEscola. The tournament will get under way with an opening ceremony on April 10 at 12.30 on pitch number 8 at the Ciutat Esportiva. After that, the more than 450 games will get going, involving played from 6 to 14 years in four categories: U8 (Initiation), U10 (Formation), U12 (Precompetition) and U14 (Competition). The first three days will be at the Ciutat Esportiva and the fields at CEM Arístides Maillol, while the finals on April 13 will be in the Miniestadi. The trophies will be presented to the winners by Gerard Piqué from 13.45. “FCBEscola is one of the main instruments for promoting and transmitting Barça and its characteristic values around the world. And what better way to dpo that than through sport? The expansion of the Barça name is one of the club’s main targets. Being present in all five continents is a pride while also demanding the utmost responsibility”. “The International Tournament is the greatest celebration of FCBEscola, where all of the knowledge acquired can be put to work and that is a way of universalising our style of play”. “All international FCBEscola projects are led by professionals trained at the club. That way we can be sure that knowledge and values are being transmitted in accordance with our philosophy. We are proud to have opened FCBEscola Basket this season and our next objective is to open our schools up to the other professional sports at FC Barcelona too”. “The values implemented at the club are very important for children’s growth. Year after year, as international ambassador, I could see the great job being done by the FCBEscolas in Dubai, Brazil and the United States”. “It is very striking to see the ambition among the children to come to Barcelona and play in this tournament, and how excited they are about playing and competing. The most important thing is for them to apply the values because they should not only become great athletes, but great people too”.